Located on the valley floor between Murren and Wengen this is the ideal resort for those wanting real choice with their Jungfrau Region Pass, especially as it includes Interlaken further down the valley. When will it snow in Lauterbrunnen? The next notable snow forecast for Lauterbrunnen is 1cm-, expected on 19 April, with around 12cm5in forecast over the next 7 days. The Swiss Ski Resort of Lauterbrunnen is part of the Jungfrau Region ski area with access to 591km367 miles of downhill skiing, with 131 marked pistes, served by a total of 66 ski lifts. In addition to the skiing in Lauterbrunnen itself (213km132 miles of pisted ski runs), the appropriate ski Lift Pass will allow you to ski or snowboard in the other Jungfrau Region ski resorts of Grindelwald, Mürren and Wengen. Lauterbrunnen at 796m (rather low for ski slopes) sits at the base of the mountain railway up to Wengen on one side and Murrren on the other. It is a pretty little village set in some of the world's most spectacular scenery. It's world famous landmark is the sparkling Staubbach Waterfall but for most the main attraction in winter is some of the most affordable lodging in Switzerland in a small, relaxed village. The most difficult run is the 'Oh God'. In an average winter adequate snow down to Lauterbrunnen only happens in January and February, when skiers can make one of the world's biggest vertical descents down the route of the Inferno race, over 2,200 metres from the Schilthorn, the famous revolving restaurant above Murren which featured in the James Bond film On Her Majesty's Secret Service (and indeed was only completed thanks to cash from the film company). There are no ski lifts in the valley itself so each morning guests normally decide whether to go up to the Wengen/Grindelwald side, or the Murren side, or indeed take the day off and head down to Interlaken - all are included on the Jungfrau lift pass. On the Mürren side the most famous runs for advanced skiers are down from the Schilthorn, the main one 6km (4 miles) back down to Mürren. If you're staying for less than three days be aware you have to pay to descend in the cable car from here, those who ski save the fare! Longer stayers get the descent included in their pass. Another good run is the Happy Valley - smooth and fast and easily reached from the cable car. An off piste and heli-ski paradise surrounds you in Lauterbrunnen. 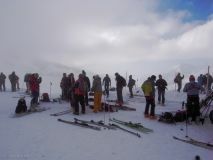 The Mountaineering Centre (offices in the mountain ski centres and Interlaken) and the ski schools offer guiding to the various off piste powder snow and glacier descents, whilst a heliski operator based in Interlaken (see Interlaken entry) can take you to mind-numbiungly wonderful descents of between a world beating 2-3000 metres when conditions are good. Lauterbrunnen offers good sking, particularly, for Expert and Intermediate skiers. Lauterbrunnen offers some good boarding and there are a variety of Snow and Terrain Parks in Lauterbrunnen. We don't currently have confirmed season dates for Lauterbrunnen. Usual opening is mid November, and usual closing is Mid April. NOTE:- Lift and Piste openings are always subject to Snow Conditions in Lauterbrunnen. Lauterbrunnen is able to make snow, on 10km6 miles of ski runs, with 26 snow cannons. The 15 ski lifts of Lauterbrunnen are able to uplift 9,200 skiers and snowboarders every hour. Lauterbrunnen is in the Swiss Alps in Jungfrau Region, Interlaken, Switzerland. The nearest airports to Lauterbrunnen are Berne, Basel and Zurich. There are nine airports within three hours drive. Berne is just one hours drive away, in good driving conditions, so you can be on the piste quickly. The Webcams in Lauterbrunnen are not always up-to-date. Please check the date on the image to ensure you are seeing current snow conditions. There are a few hotel bars in Lauterbrunnen but you have the option of popping down to sample the huge choice in Interlaken or staying on the mountain after the lifts close in Wengen or Murren and getting a late train down (but be sure you catch the last one, Cinderella, or it's a long, cold walk). If you opt for Murren the Eiger Bar is popular and the Palace Hotel has an up market cocktail bar and disco. The Tachi disco (do not mis-pronounce) is more laid back. 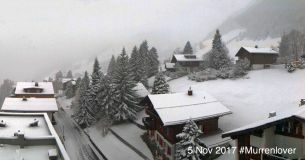 Want to Know when it Snows in Lauterbrunnen? 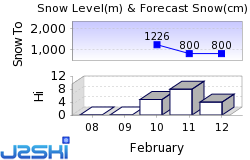 Click above to get Snow Reports by e-Mail for Lauterbrunnen. By doing so, you agree to Our Rules. 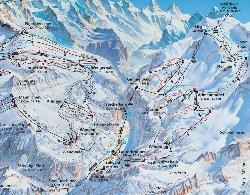 Other popular Ski Areas near Lauterbrunnen. For current snow conditions, see our Lauterbrunnen Snow Report. Want to ask about skiing and snowboarding in Lauterbrunnen? Note :- The information on J2Ski concerning Lauterbrunnen, where not clearly factual, is opinion only and is neither definitive or exhaustive. Warning :- Snow Sports are Dangerous! Skiing, snowboarding and all winter sports involve risk of serious injury or death. You MUST confirm all information, especially snow and weather conditions, in Lauterbrunnen before you ski or board. You participate at your own risk.